They have promoted mental health awareness, raised funds for important causes and advocated for justice for Indigenous Peoples. The accomplishments of this year's Gordon Cressy Student Leadership Award winners know no limits. Just over 200 award recipients met in Convocation Hall on Tuesday evening to receive their certificates from University of Toronto President Meric Gertler and Gordon Cressy, a former Toronto city councillor and former vice-president of development and university relations at U of T. Cressy was also president of the United Way of Greater Toronto. President Gertler said the Cressy Award recipients have shown tremendous ability by balancing their commitment to community service with the demands of their degrees. “They have contributed in countless, diverse ways to the advancement of the university and of society as a whole,” he said. The award was established in 1994 to recognize students who have made outstanding extracurricular contributions to their college, faculty or school, or to the university as a whole. Cressy's son Joe is the current city councillor for Ward 20 Trinity-Spadina, which includes a large swath of the downtown Toronto campus. After 24 years of attending the awards ceremony, he told U of T News he is always impressed with the recipients' achievements. “When you hear the bios and what people have done, every year it lifts you up in a world that has far too much chaos these days,” he said. 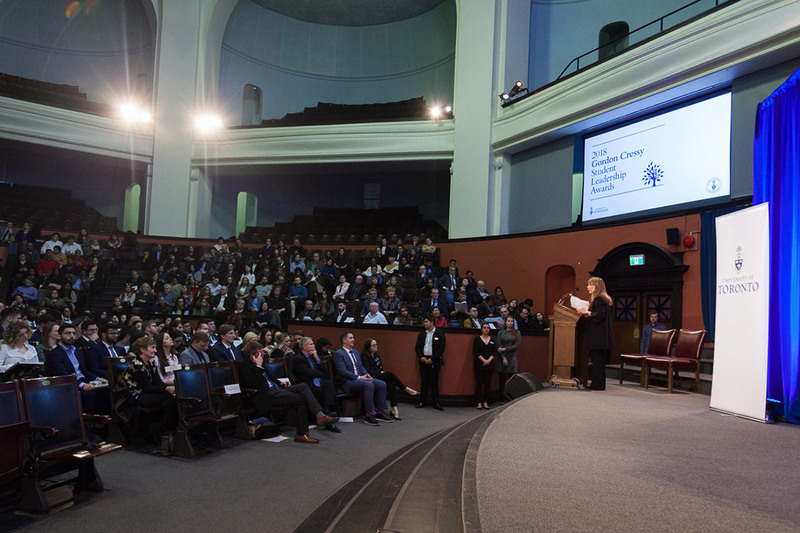 U of T News spoke with five award winners at the ceremony, asking them how they will continue to make a difference in the world after graduation. Edun was the president of the Nigerian Students Association. He's known as an advocate for diversity in engineering and across the university, and was a mentor to students as a teaching assistant and residence don at New College. White was chair of the U of T student chapter of the Canadian Society for Chemical Engineering and she was on the student program committee for the 2018 Chemical Engineering Conference to be held in Toronto this fall. Branco likes to bring people together over the dinner table. He was the president and founder of the Rotman Culinary Club, the president of the Rotman wine society and he was a star on the student Iron Chef culinary competition for two years in a row. As vice-president, academics for U of T's engineering society, Igbinakenzua worked hard to improve the student experience. Rai – who started her studies at U of T Scarborough – worked in recruitment for the IMAGINE Clinic, which provides health-care services to underpriviledged communities in Toronto. She helped recruit health professionals to volunteer their time to the clinic. She was also president of the Pharmacy Student Service Team and organized events encouraging pharmacy students to give back to their communities with annual food and toy drives.